Haier, EdgeStar and Whirlpool make the best countertop, freestanding and built-in wine coolers. All come in a variety of capacities for any size wine collection or available space. Whether you prefer white or red, the right wine cooler will enhance your collection. The Haier 6-Bottle Wine Cellar gets raves from owners, who say it's the perfect size for keeping a small amount of wine always at the ready. This single-zone wine refrigerator has a temperature range of 46 to 66 degrees Fahrenheit, making it appropriate for either whites or reds. Many users say they purchased this wine cooler to have a compact, countertop wine cooler in their apartment or RV. If you need something bigger, it also comes in 8-bottle, 12-bottle and 16-bottle sizes (the 12- and 16-bottle refrigerators are dual-zoned) and all get equally stellar reviews. The EdgeStar CWF34ODZ can hold up to 34 bottles of wine and has dual temperature zones for storing red and white wines at their respective ideal temperatures simultaneously. Its stainless-steel door and wood-trimmed wire racks make it an attractive addition to your kitchen or dining room, and it boasts ultra-quiet with simple-to-use controls -- plus a built-in lock to keep your expensive wine collection safe. While the EdgeStar's temperature may vary up to four degrees from the chosen setting, it maintains a relatively consistent temperature well within the appropriate range for storing your favorite wines. The Whirlpool 15-Inch 34-Bottle Wine Cellar can hold up to 34 bottles of wine, and it's attractive enough to be used as a freestanding wine cooler or a built-in unit. Thanks to a door-open alarm, you don't have to worry about spoiling your wine collection by accidentally leaving the door cracked open, and a high-temperature alarm alerts you when the temperature rises above the ideal storage temperature. Six pull-out, wood-front wire racks make it easy to access your collection, and the Whirlpool's slim, 15-inch design makes it suitable for installation in tight spaces. Wine coolers, also called wine refrigerators, are designed to keep red and white wines stored at a consistent temperature that best preserves their character and quality. Wine coolers are meant to store wine you intend to drink within about a year; they're not intended for the long-term storage and aging of high-end wines. Many people use wine coolers in the kitchen to supplement a standard refrigerator or mini fridge (which are covered in their own reports), but they can also make a nice addition to a wet bar or party room. Depending upon the size of the wine cooler, it may have one or two temperature zones. Two temperature zones make it convenient to store more than one type of wine. Experts say that white wines should be stored at 48 to 55 degrees Fahrenheit, depending upon the type. Red wines, on the other hand, should be stored at between 60 and 68 degrees, again, depending upon the type. Usually, the number of available temperature zones will depend upon the size of the wine refrigerator. Smaller, countertop units usually have only one zone, larger units will have two or more. There are two types of cooling technology found in wine refrigerators: Compressor-based and thermoelectric. Wine coolers with compressors work like traditional refrigerators, using coolant and fans to cool the air inside the wine cooler. Hot air is vented out the front, away from the cooler. Thermoelectric wine coolers do not cool air, rather, they rely on heat transfer to remove the heat from inside the compartment, and the heat is usually vented out the back. That means that thermoelectric coolers require a fairly generous amount of space around them to allow the air to circulate. While wine fridges with thermoelectric cooling systems can be used as built-ins if the installation is planned carefully and plenty of room is left for circulation, most experts advise against it and say if you're going to have a built-in unit, go with a compressor-type wine refrigerator. Another drawback to thermoelectric systems is that they are sensitive to the temperature outside the unit since they can only cool the compartment to about 20 degrees below the ambient temperature. If the air around the cooler is too warm, the unit may not be able to maintain a temperature below 55 degrees, meaning that your wine may not be held at a stable temperature, or at the correct temperature for some wines. By the same token, if the ambient temperature is too cold, say, below 50 degrees, the wine cooler's temperature may drop below what's ideal. However, if you keep your thermoelectric wine refrigerator in a climate-controlled environment -- heated during cold winters and air-conditioned during hot summers -- they are extremely affordable and attractive appliances that come in a variety of styles and sizes. If you plan to store fewer than 20 bottles in your wine cooler, countertop models are the most cost effective. By far the top-rated of these is the Haier 6-bottle Wine Cellar with Electronic Controls (Est. $125). This thermoelectric wine cellar is the smallest in a line of wine storage refrigerators that also includes 8-bottle, 12-bottle, 16-bottle and 18-bottle capacities. However, the 6-bottle wine fridge is very popular with those who have little floor space and just need a small wine refrigerator to provide them with a steady supply of chilled red or white wine. It fits nicely on the kitchen counter of even small apartments or RVs, owners say, and consistently maintains the chosen temperature. 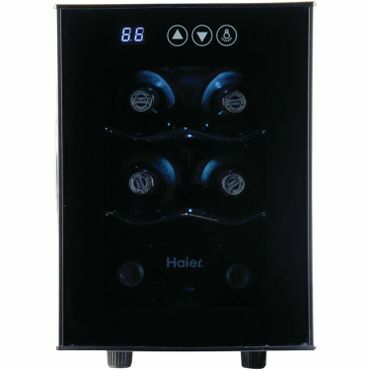 The 6- and 8-bottle Haier units have only a single temperature zone, while the 12-, 16- and 18-bottle wine coolers in the same series have two temperature zones. The Haier 6-Bottle Wine Cellar has a temperature range of 46 to 66 degrees Fahrenheit, which is in the suggested range for either white or red wines. Haier suggests allowing two inches of clearance on the sides and in the back and four inches of clearance on the top of the unit to allow for proper air circulation. It has a manual defrost, digital touch-screen temperature control with a blue LCD display, and two pull-out chrome wire shelves for easy access. This countertop wine cooler is reported as very quiet and sturdy, and we saw no significant durability complaints. The Wine Enthusiast 6-Bottle Touchscreen Wine Cooler (Est. $130) is another small, countertop wine refrigerator that gets solid reviews from owners. It's very close in overall size to the Haier, but instead of two pull-out shelves, it has three, each able to hold two bottles of wine. However, we did see some comments that this wine cooler will only hold six rather slender bottles, and does not hold six bottles of larger-sized wines, such as champagne. Like the Haier, this thermoelectric unit also has one temperature zone that can be adjusted from 46 to 66 degrees Fahrenheit. It requires three inches of clearance on all sides for proper air circulation. Owners say it's attractive, quiet and maintains a consistent temperature. The Avanti 12-Bottle Wine Cooler (Est. $130) is twice the size of the Haier and Wine Enthusiast wine fridges, but it also gets very good reviews as a countertop wine cooler -- if you have a bigger space. The Avanti wine fridge can hold eight bottles horizontally on racks and four upright, which reviewers say is very handy for storing open bottles. It needs at least five inches of clearance on the back and sides of the unit to allow for proper air circulation. A readout on the Avanti's exterior displays the temperature in either Celsius or Fahrenheit and the temperature range is 48 to 64 degrees Fahrenheit. It is only a single-zone cooler, but those who drink just white or just red wine say they appreciate having wine at the perfect temperature. It's meant for use in areas with an ambient temperature between 72 and 78 degrees Fahrenheit and is designed to operate at a maximum of 30 degrees below the ambient temperature. This thermoelectric cooler gets poorer reviews for durability than either the Haier or the Wine Enthusiast cellars, but most say it works very well and Avanti gets good reviews for its customer service. If you want to store more than just a few bottles of wine, you'll want to consider a freestanding wine cooler. More affordable than built-ins, which we discuss below, freestanding thermoelectric wine coolers cost less because they don't have to accommodate the front venting and zero side and back clearances that under-counter wine refrigerators require. That said, as with countertop wine coolers, you'll need to find a spot with plenty of clearance so air can circulate around the appliance -- but they accommodate more bottles of wine than a countertop wine cooler will. These larger, freestanding units also usually have dual temperature zones. The EdgeStar CWF340DZ 34-Bottle Wine Cooler (Est. $400) edges out other freestanding wine coolers in professional tests, chilling wine faster than the competition and maintaining the most consistent temperatures. It holds up to 34 standard-size wine bottles -- less if you're storing larger or unusually shaped bottles. It has dual temperature zones; the upper zone, for white wines, has a temperature range of 41 to 54 degrees Fahrenheit and the lower zone, for red wines, has a range of 54 to 64 degrees Fahrenheit. One convenient feature is its reversible door, enabling users to adjust it to swing open to the left or the right for easy integration into any space, and interior LED lighting provides just enough light to allow you to browse your collection without exposing your wine to too much damaging light. Users particularly like the EdgeStar's stylish design, which features a stainless-steel trimmed door and wood-trimmed wire racks for a unique look. A built-in lock keeps your wine collection safe. It's intended for installation in areas with an ambient temperature between 50 and 95 degrees Fahrenheit with ample ventilation, although the owner's manual doesn't specify specific clearance requirements. Users say it's quiet with easy-to-use controls. A few owners point out that the temperature may fluctuate up to four degrees from the chosen setting, but as it's still within the ideal temperature for wine storage, it doesn't impact overall performance. The Wine Enthusiast 18-Bottle Dual Zone Silent Touchscreen Wine Cooler 272 03 18 (Est. $270) is another dual-zone thermoelectric wine cooler that earns positive feedback from owners. It stores up to 18 bottles of wine -- 10 in the top zone and 8 in the bottom zone -- with digital touchscreen controls and an LCD temperature display. The top zone has an adjustable temperature range of 54 to 66 degrees Fahrenheit, and the bottom zone ranges from 46 to 66 degrees Fahrenheit. Both zones offer ideal storage temperatures for both red and white wines, while the bottom zone also provides ideal serving temperatures for white wines. The unit has seven pull-out, adjustable chrome shelves that can be configured to allow for upright bottle storage in one portion of the upper zone. Interior LED lighting and a reflective smoked-glass Thermopane door with stainless-steel trim give this wine cooler a sophisticated look. Like all freestanding wine coolers, the Wine Enthusiast 18-Bottle Dual Zone Silent Touchscreen Wine Cooler requires ample clearance to allow for proper air circulation. It's meant for use in an area with an ambient temperature lower than 75 degrees Fahrenheit. Owners like its sleek, slim design, which is ideal for smaller spaces. Users say it maintains desired temperatures well and is so quiet that it's practically silent. 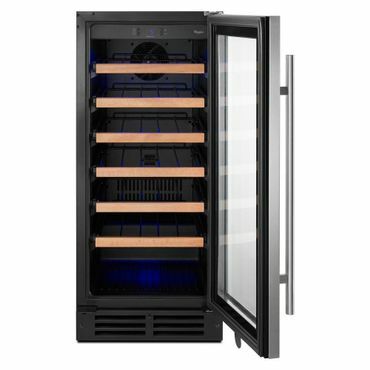 If you like the look and functionality of this unit but need more storage, the Wine Enthusiast Silent 32-Bottle Dual Zone Touchscreen Wine Cooler 272 03 32 (Est. $360) is a larger version that holds up to 32 wine bottles. Koldfront 18 Bottle Free Standing Dual Zone Wine Cooler TWR187ESS (Est. $190) is one to consider. It has dual temperature zones, with the top zone ranging from 54 to 66 degrees Fahrenheit and the bottom zone from 46 to 66 degrees Fahrenheit, with a centrally located control panel for adjusting each zone's temperature independently and an LCD display that conveys the current temperatures. Like the Wine Enthusiast 18-Bottle Dual Zone Silent Touchscreen Wine Cooler, the Koldfront holds up to 18 bottles of wine. It's similar in design to the top-rated EdgeStar, with a stainless-steel finish on the door, safety lock and slide-out wooden shelves -- made entirely of wood, unlike the EdgeStar's wood-trimmed wire shelves. The four wooden shelves are removable, allowing for reconfiguration for storing larger bottles of wine (although this will decrease the unit's capacity). To remove the shelves, the door must be able to swing open to 180 degrees. Interior LED lighting illuminates your wine collection with a non-intrusive, delicate light. Owners say the Koldfront's shelves slide in and out easily, although the space is a bit tight, so it's sometimes necessary to pull out a shelf to retrieve or add a bottle of wine. Additionally, because the fan protrudes into the unit, some shelves can only hold shorter bottles, and there's no option to store bottles upright in this unit. Overall, most owners say it's fairly quiet, but not totally silent. The unit is relatively small, and a few owners report using it as a countertop model -- although this only works if you have an open area with no low-hanging upper cabinets. If you need a larger capacity, this Koldfront series also includes models that can store up to 24 or 32 wine bottles. Finding a dedicated space in your kitchen for a built-in wine refrigerator is becoming an increasingly popular option for wine lovers. Built-in wine coolers are discreet, stylish and look as if they're merely part of the overall décor, just like any other modern kitchen appliance. The one big difference with built-in coolers as opposed to the freestanding models profiled above is that they use compressor technology, rather than thermoelectric, so that they don't need air-flow space around them and can be set flush into the available space, just like a standard refrigerator. Owners say the Whirlpool 15 in. W 34-Bottle Wine Cellar WUW35X15DS (Est. $800) is a good bet among built-in wine coolers, featuring a reversible door for easy integration into your kitchen's existing layout. It can store up to 34 bottles of wine and has a single temperature-controlled zone with a temperature range of 41 to 64 degrees Fahrenheit. Like many wine coolers, the Whirlpool features subtle interior LED lighting to illuminate your wine collection without damaging your delicate wines. The Whirlpool also has a door-open alarm, preventing you from spoiling your wine by accidentally leaving the door cracked open, and a high-temperature alarm to let you know when your collection reaches a less-than-ideal temperature. The Whirlpool has six pull-out wood-front wire racks, a black cabinet and a stainless-steel door, making it attractive enough for use as a freestanding wine cooler or a built-in unit. With four adjustable leveling legs, you can install this wine cooler anywhere -- even if the floor is uneven. Owners say it's quiet and elegant, simple to install, and maintains a consistent temperature with easy-to-use, precise temperature controls. At just 15 inches wide, users say it fits perfectly in narrow spaces. The only downside is that the racks aren't adjustable, so larger wine bottles must be stored either on the top or bottom shelf. If you're a wine aficionado and need a larger capacity, the GE Profile PCR06WAT[SS] (Est. $1,260) holds up to 57 bottles of wine and performs well in professional tests. It features seven full-extension wine racks with Beechwood fronts (five full-depth racks; two half-depth racks), and electromechanical temperature controls for easy temperature adjustment, including a red wine setting (55 degrees Fahrenheit) and white wine setting (45 degrees Fahrenheit), with an overall temperature range from the low-40s to mid-60s Fahrenheit (GE does not provide specific temperatures, just ranges). Like the Whirlpool, the GE Profile can be used either as a built-in or a freestanding wine cooler, and it features a tinted glass door with interior LED lighting for subtle illumination. The GE Profile has a temperature variance throughout the unit, making it possible to store both red and white wines by storing whites in the cooler areas (the bottom) and reds in the warmer areas (the top). The temperature in these zones cannot be controlled independently, however – there's just a single knob that turns from the white to red settings -- and a few owners are perplexed by the lack of a thermostat or temperature display. The top five full-extension shelves can hold either eight (two bottles deep, with necks alternating facing front and back) or nine (alternating with the necks pointing inward) bottles each, and the bottom two drawers can hold up to six bottles each (with necks facing the rear). In professional tests, it earns good scores for temperature performance and its quiet operation. Owners agree, also noting that they appreciate the removable shelves, but some users say that arranging wine bottles just so can be a pain if you're at or near capacity. If you want a built-in that's a bit smaller -- and is tall and thin rather than square -- you can't do better than the EdgeStar Built-In 18 Bottle Wine Cooler (Est. $430). Like the Whirlpool, it's very attractive, with a black cabinet and brushed stainless trim and wood-trimmed slide-out shelves, plus blue interior LED lighting and dot matrix protection on the glass. The door is also reversible. This 18-bottle wine cooler has only one temperature zone, with a range of 40 to 65 degrees, so it's best for only whites or only reds, but owners say it holds its temperature very consistently and its digital controls are easy to set. The EdgeStar 18-bottle wine cooler makes for a tidy built-in -- about the size of a trash compactor, say owners -- but it can also be used as a freestanding unit as well. We found several recent, comparative professional reviews of wine coolers. ConsumerReports.org puts nine wine chillers to the test in one professional roundup, and YourBestDigs.com evaluates six wine coolers over a two-week period with 50 bottles of wine. 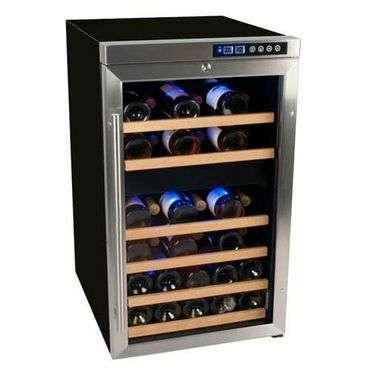 We also consulted two roundups of lab-tested wine fridges from TopTenReviews.com and Reviews.com. For a glimpse into real-world performance and ease of use, we carefully analyzed thousands of owner reviews we found at retail sites, such as Amazon.com, HomeDepot.com, AJMadison.com, WineEnthusiast.com and WineCoolerDirect.com. In addition, the latter two sites, which deal with all things wine-related, are great resources for learning about wines and wine coolers and helping you make the best choice for your needs.